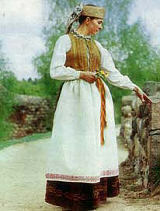 The feast day of St. Agnes is especially popular among Lithuanians. A year after her death, the Etno volcano erupted, most people held that to be a punishment for Agnes’ killing. For this reason, Agnes was made guardian and protectress of fires which escaped from Etno volcano and all other fires. St. Agnes took the place of Gabija, pagan goddess of fire. During the first days of February, Lithuanians offered bread to goddess Gabija, kept a piece of it at home as a safeguard against conflagrations. St. Agnes is always represented holding a bread roll in her hand. On February 5th , bread together with water and salt is consecrated in all Lithuanian churches. Pieces of this bread were divided among family members, any left over pieces were placed in honorable spots, most often behind pictures of Saints and on beams in the house. In Southeastern Lithuania, fire is laid on the stove or under the stove, to keep the fire from leaving the house but to protect the house from conflagration. In Northern Lithuania, to honor St. Agnes on her feast day, fires were sprinkled with consecrated salt. The use of consecrated bread on St. Agnes’ feast day had a wide and varied use: mothers gave pieces of this bread to sons going off to war, so that they would be protected from bullets. This bread was placed in luggage when preparing to go on a long trip. Near the region of Dieveniðkës, the plowman, going out for the first annual plowing, tied a piece of this bread to the plow shaft to prevent the sun from burning the crops. In Eastern and Southeastern Lithuania when sowing flax seed, it was tradition to tie St. Agnes’ bread to the seeder, so that the new flax fibers would grow to be very white. Pieces of consecrated bread were placed in beehives, to keep bees from dying and stimulate honey production. Pieces of this bread were placed in the foundations of newly built houses, to protect them from fires.